These are lyrics by Fast Food Rockers that we think are kind of repetitive. 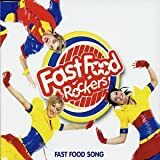 Fast Food Rockers', "Fast Food Song"
aaaaaagggggh! This song should come with a health warning, it's so bloody repetitive and just plain bad! I hope this burns in hell along with 'Soda Pop' by Britney Spears, 'Baby' by the queen of soulless R'n'B herself, Ashanti and 'Agadoo' by some wanker (if youre English, you'll know it, which is unfortunate).